Axons from the study’s organoids attached themselves to embryonic mouse spinal cord cells. Three things distinguish the lentil-sized mini-brains developed by Dr. Madeline Lancaster, of the Medical Research Council’s Laboratory of Molecular Biology at Cambridge, and her colleagues. First, a new method of supplying them nutrition has allowed the organoids to survive and continue developing for over a year. Second and third, they’re the first organoids attached to spinal cords and muscle tissue, and — here’s the startling part — they reached out and connected themselves to those spinal cord cells. Oh, also: They made the muscle tissue twitch. Scientists such as Lancaster have been experimenting with organoids for a while now to improve our understanding of brain development and neurological disorders. However, her team’s new research, just published in Nature Neuroscience on March 18, has, in light of these findings, taken things to another level. Before getting too creeped out, it’s worth taking a moment to understand the rudimentary nature of organoids as they currently exist. The human brain is believed to contain some 100 billion neurons. The most advanced organoids so far possess just a couple of million — twice what a cockroach has and much less than an adult zebrafish. Still quite capable, but hardly human, it’s becoming clearer that animals with fewer neurons than we have are likely sentient. The value of having organoids for research, however, is obvious, opening a window into all manner of human processes and diseases. All that having been said, it can be expected that mini-brains will grow more and more sophisticated over time. This raises all sorts of ethical questions we should be addressing now, before we have a problem on our hands, if we don’t already. Slide from Lancaster’s TEDxCERN presentation. Most organoids don’t grow for very long, because as the organoid grows, the nutrient solution in which it bathes can no longer reach its innermost neurons, and they die, terminating the growth cycle. In this research, scientists employed an “air-liquid interface culture.” The primary purpose of the research was to verify the value of such an approach. Each organoid was sliced into 1/2 millimeter-thick slices and attached to a membrane that was then introduced to a nutrient solution. This allowed the central neurons of each ALI-CO (for “air-liquid interface cerebral organoid”) to continue receiving oxygen and nutrients. The organoids grew and produced new, healthy cells for more than one full year. Because the ALI-COs’ slice cultures were relatively easily to manipulate, the scientists were able to perform live imaging of them to assess their progress and the structures they developed. To identify the cells being produced, the team employed single-cell RNA (scRNA) sequencing to analyze six slices from three ALI-COs’ cells, with an average of 4,427 cells per sample. The live imaging revealed that axons, the nerve fibers that connect neurons, produced healthy outgrowths “reminiscent of nerve tracts” in the ALI-COs throughout the study, and various natural turning behaviors were observed. 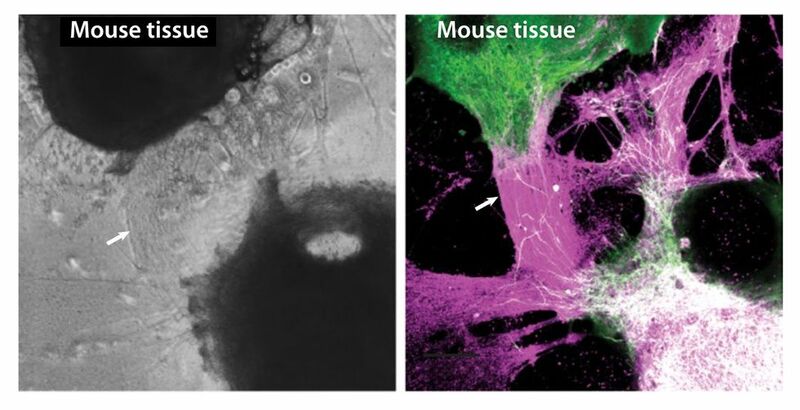 Neurons also successfully developed complex dendrites — connectors — as the organoids continued to grow. The complement of cells in the organoids was reminiscent of those in an organic embryonic brain. 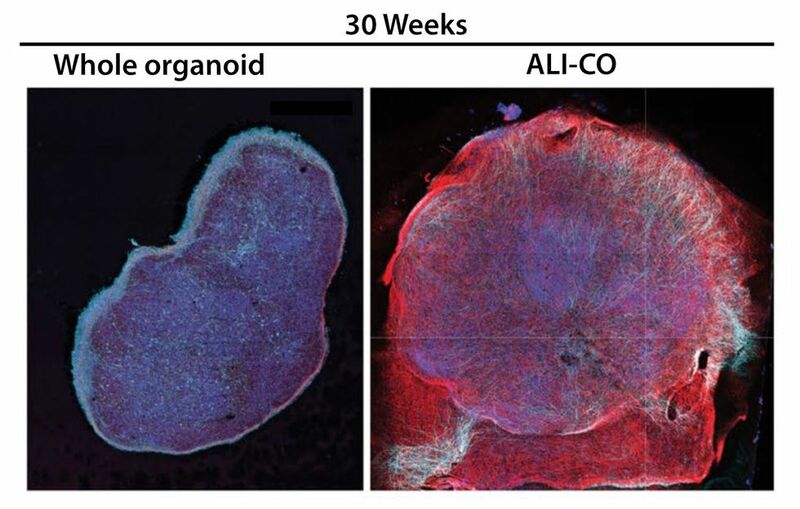 Comparison of non-ALI-CO organoid vs. vibrant ALI-CO at 30 weeks. Image source: Lancaster, et al. As the final test of the ALI-COs’ complexity, cells of spinal column attached to back muscle tissue from embryonic mice were co-cultured with the organoids. “After 2–3 weeks in co-culture,” reports the study, “dense axon tracts from the ALI-COs could be seen innervating the mouse spinal cord, and synapses were visible between human projecting axons and neurons of the mouse spinal cord.” One might reasonably ask why: What did the “brain” have in “mind?” Let’s hope it’s simply instinctive behavior on a cellular level. Next, the back muscles started twitching. While random muscle contraction occurs in disconnected tissue, these were much stronger, were arhythmic pulses, and could be switched off by severing the axonal connections. To further verify what seemed to be happening, researchers directly stimulated remaining axonal connections and verified their ability to produce muscle contractions. Also, the “evoked muscle contractions were intensity-dependent such that larger stimulation currents increased the amplitude of the muscle contraction.” There’s thus little doubt that the mini-brains were controlling the muscles connected to the spinal cords they’d reached out to and connected to. Welcome to the future. Bright-field and stained views of organoid/spinal cord connection. Image source: Lancaster, et al.